West Kill Brewing is worth traveling long distances through winding mountain roads. On a map, it appears to sit at the foot of Hunter Mountain, but it’s a 30-minute drive around Rusk Mountain Wild Forest to get from the parking lot of the ski mountain to West Kill’s picturesque, deep-in-the-woods location. My friend, who has a house near Woodstock, drove about 45 minutes to West Kill and met some guys there who had left their car on 23A and hiked over. A few beers deep, with night-falling over the mountains, the tipsy hikers convinced some new buddies to drive them back to their vehicle. If you don’t have a designated driver, I’d highly recommend pairing your brewery visit with a room at the Spruceton Inn, which is just a 5-minute walk down Spruceton Road. We made the journey after sampling some West Kill beers at Camp Here Here and Windham Local. Beers always seem to taste better at the place where they were made, but this place is particularly special. Now, I try to reel myself in when I start to over-romanticize beer. Few beverages bring me more joy than an ice-cold High Life tall boy, so I really don’t claim to be a beer connoisseur. And I understand the desire to roll your eyes and dismiss a “foraged beer” as hipster nonsense, but man, have you tried West Kill’s Forsaken Fields? It felt like a dream to sip a golden glass of this earthy, softly piney saison, made with creeping thyme and spruce tips, while sitting beside the fields from which the wild thyme was plucked. Plus, during our late-summer visit, Bread Alone was there to serve pizza. It doesn’t get much better than fresh-brewed beer and carbonara pizza, topped with chewy bacon bits, crisp-tender zucchini, and sweet caramelized onions. The food offerings vary, but you can find the most current info via the West Kill Brewing Instagram feed. 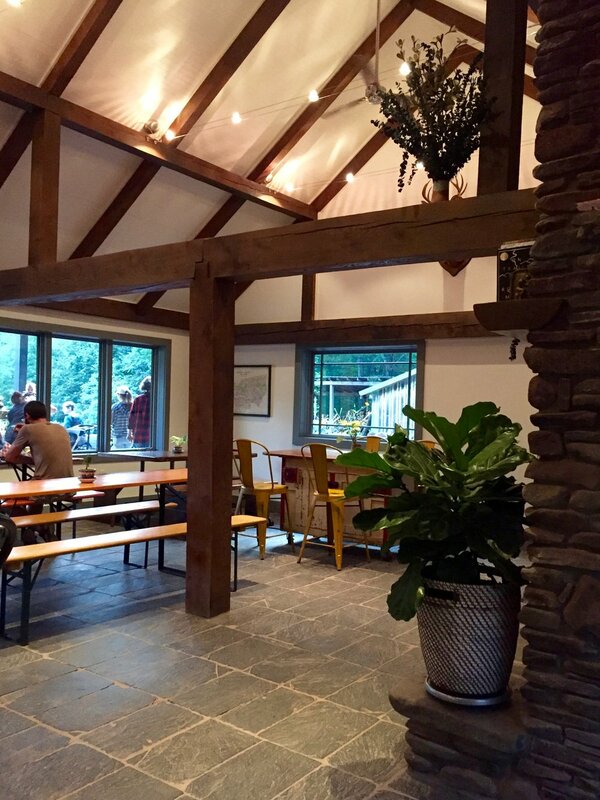 So, if you’re trying to decide which Catskill breweries to visit, I’d recommend Suarez for their crisp pilsners, Sloop for their dank IPAs and tasting room-adjacent playground, and Honey Hollow for the clubhouse-style friendliness, but if you’re looking for great beers with a breathtaking view? West Kill beats them all, hands down. It’s just the prettiest place. And as ice and snow overtake the mountains, their taproom is a very cozy place to be, no matter how long it takes to get there. West Kill Brewing is located at 2173 Spruceton Road in West Kill, NY; (518) 989-6001. Check their website for updated hours and to see which of their beers are currently on tap. Aug 30 Top-Secret Beer Hideout: Honey Hollow Brewing Co.